Release anxiety by identifying the physiological symptoms. These images were kindly supplied by Dr Christine Wekerle and her team. Focusing on the positives and joyful moments in our lives can help us to build resilience, cope with challenges and be the best we can be. But can an app help us to do that? Researchers at McMaster University think it can. Life is a journey full of challenges, triumphs and all that’s in-between. When we’re faced with challenges, this can leave us feeling tired, stressed and worn out emotionally. And it can be hard to stay positive and keep our negative emotions in check. We might think about getting more sleep, exercising or setting up a study routine, but what about self-compassion and being kind to yourself? According to research conducted by Dr Christine Wekerle and her team in Ontario, Canada, youth who have experienced adverse childhood events such as abuse are less likely to display problem behaviour if they have high levels of self-compassion. It appears, then, having a resilient mindset allows us to keep mentally and physically well, but keeping positive is easier said than done. With this in mind, Chris and her team have designed an app known as “JoyPop” that can help young people build on their resilience on a daily basis. According to the American Psychological Association, resilience is ‘the process of adapting well in the face of adversity, trauma, tragedy, threats or significant sources of stress — such as family and relationship problems, serious health problems or workplace and financial stressors’. Chris has devoted much time to studying resilience and how youth can build it. From her studies, she has found that most young people have incredible resilience potential. However, she has also found that youth find it difficult to manage their emotions, organise their thoughts, and express themselves – making it harder to unlock this resilience potential. HOW CAN WE BE RESILIENT? We all have a natural resilience, but how we tap into this will depend on how much attention we pay to it. In any given day, resilience can fluctuate, meaning that the same difficulty or challenge will feel harder to overcome at different times in our lives. Many people believe that the key to experiencing joy is by eliminating negativity altogether. But, in a lot of cases, we cannot run away from the challenge; nor change the circumstances we’re in. Chris suggests that we should, instead, focus on the positives. Positive thinking, and the feeling of joy that goes with it, can help us to routinely draw on our resilience. WHO EXACTLY WORKED ON THE APP, AND WHY? 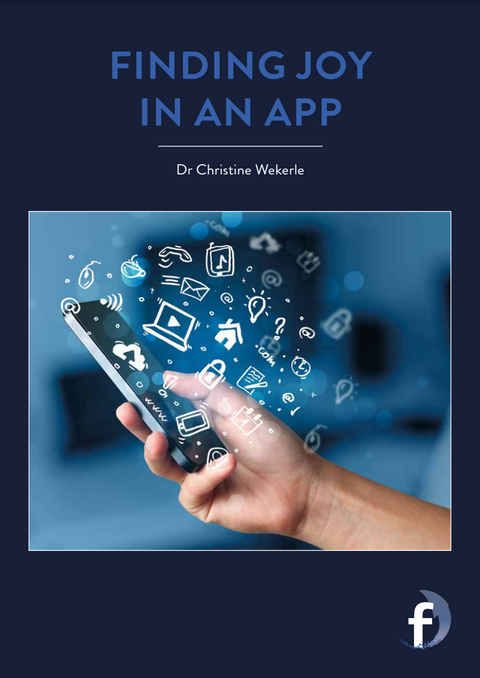 Chris and her team felt that an app would be a great tool for helping young people to draw on their own resilience – but nothing like this currently exists. 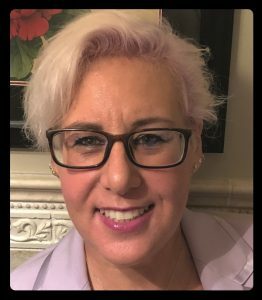 To understand what would appeal to the youth, she worked with undergraduates at McMaster University, professionals who work with young people, and a group of youth advocates, aged 16 and up, who ran a weekly Twitter account called TEARtalk (Teens Ending Abusive Relationships). 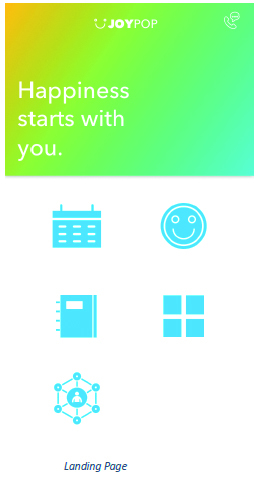 Clearbridge Mobile, an app development company based in Ontario, helped create the app in full. WHO IS JOYPOP AIMED AT AND IS IT AVAILABLE NOW? Anyone can use JoyPop. At the moment, it’s being tested among youth who are in their first year at university, which for many is a stressful time. But the app’s features have been designed to appeal to boys and girls as well as young men and women. 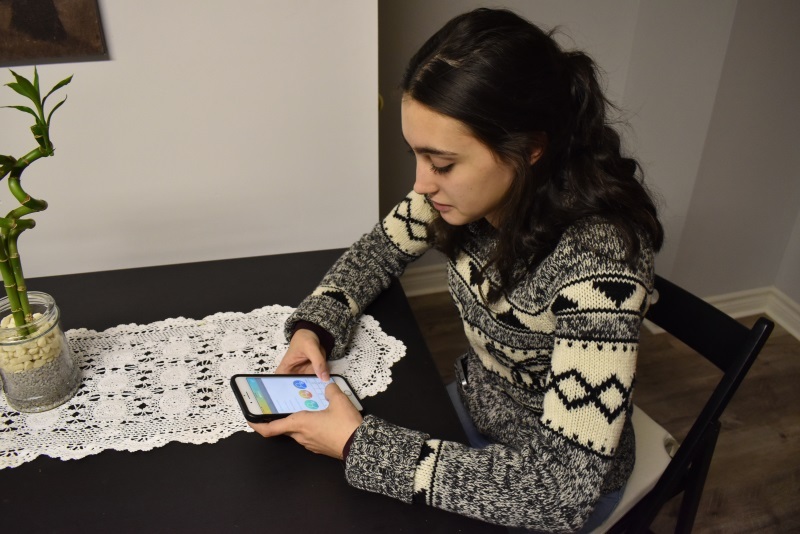 The app is still in this testing phase, with Chris and her team working on further research studies to understand how the app might be adapted to different circumstances; for example, for youth living in adverse environments. The aim, though, is to have it available in 2019 for anyone who feels they could do with a little more positivity in their lives. 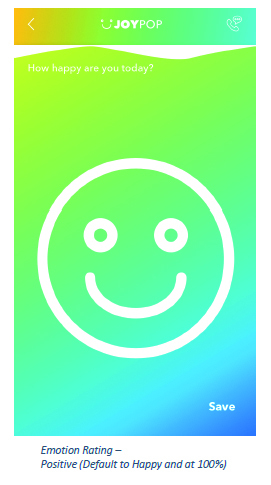 RESEARCH PROJECT: JoyPop, an app that helps you to track changes in your mood, focus your attention, organise thoughts, and engage in positive activities. 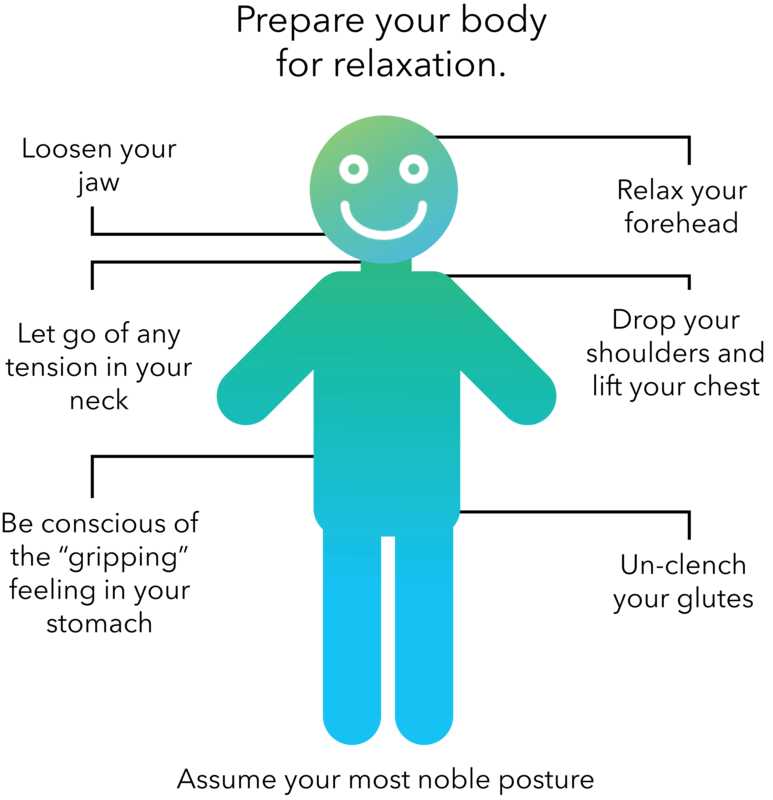 In turn, this helps you to manage stress, deal with challenging circumstances and make good decisions. at different times in our lives. Many people believe that the key to experiencing joy is by eliminating negativity altogether. But, in a lot of cases, we cannot run away from the challenge; nor change the circumstances we’re in. Chris suggests that we should, instead, focus on the positives. Positive thinking, and the feeling of joy that goes with it, can help us to routinely draw on our resilience. A ballet dancer, theatre actor, painter…. My mother, though, was insistent that I become a doctor of some sort. I did really like science, especially chemistry. When I was a child and a teenager, I pushed myself a lot. I submitted poetry to a library contest; I sent my clothing and shoe designs to a department store contest; I got myself an agent for acting. Looking back, all of these learning experiences helped me deal with the unexpected, and tested my skills and boundaries. They helped me to focus on what I really wanted to do so I could let go of things I wasn’t so good at or prepared to do. WHICH SUBJECTS DID YOU END UP STUDYING AT UNIVERSITY? I did an honours undergraduate degree in clinical psychology, before going on to graduate school where I studied clinical psychology. IF YOU COULD GO BACK IN TIME WHAT ADVICE WOULD YOU GIVE YOURSELF WHEN YOU WERE STARTING OUT ON YOUR CAREER PATH? else you’re doing because you’re managing stress. There’s lots of evidence to show that exercise is good for mild to moderate depression and anxiety. Chris really wanted to be an actor when she was younger, and so she got herself an agent. Here she is acting in an TV advertisement for Tim Horton Coffee & Donuts in 1982. What do you think? Should she get back into acting or keep helping young people with her research? 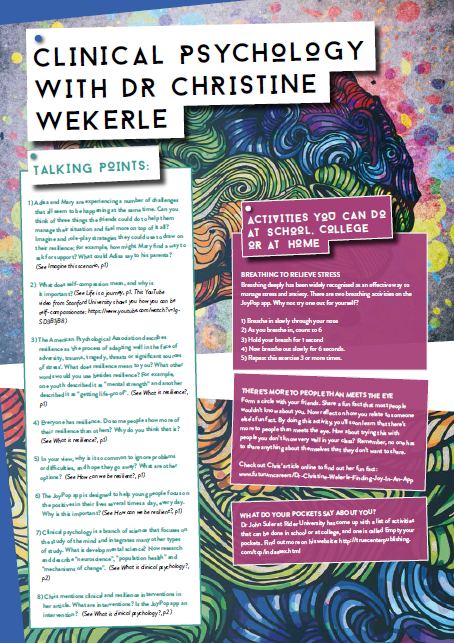 Check out the activity sheet (Clinical Psychology with Dr Christine Wekerle) and find out more about your friends and family with the “There’s more to people than meets the eye” exercise. Clinical psychology is a branch of science that focuses on the study of the mind. It integrates many other types of study such as developmental science, neuroscience, population health, and mechanisms of change (understanding how and why people change their behaviour). In a practical sense, clinical psychologists use psychological science theory, laboratory studies and human research to identify models of distress or dysfunction, as well as wellness, resilience and personal development. Clinical and resilience interventions can then be developed and tested for effectiveness and impact. WHY DO WE NEED CLINICAL PSYCHOLOGISTS? Clinical psychologists help people to deal with trauma, mental illness and behavioural problems. There are so many different contexts where clinical psychologists are valuable – workplace wellness, mental health, first aid, humanitarian crises, coping with climate disasters, family dynamics and dysfunction, school bullying, cyberbullying, sexual exploitation, social justice, advocacy, policy and good government, and so forth. Clinical psychology may also be a stepping stone to many other areas such as the military, public health and international rights. Given that clinical psychology has such broad applications and can help people with such a large variety of problems, clinical psychologists are well sought after. WHAT PASSIONS AND PERSONAL QUALITIES DO YOU NEED TO WORK IN THIS FIELD? A curious mind is critical. On a personal level, compassion is an important quality to have. That’s why getting involved with community-based, collaborative activities is a good idea if you want to pursue a career in psychology. Psychologists will encourage you to spend time with those who are experiencing psychological or psychiatric challenges, because it’s important to confirm that you have the needed compassion and are able to work in these sensitive areas. It’s also a great way to learn how to deal with the unexpected. In summary, excellent communication and interpersonal skills are needed. Of course, the process of becoming a clinical psychologist will differ from country to country. This is especially true when it comes to registering as a practitioner after your studies. Generally speaking, however, it begins with an undergraduate degree in psychology at university, which teaches the fundamentals of psychology. After that, you’ll need to undertake postgraduate studies in clinical psychology – usually either a postgraduate diploma or a master’s degree. Then, you’ll need to earn a doctorate. Hello, where can I find the app? My 17 year-old daughter needs this to understand the emotions in her head – translated by the web moderator. Merci de votre intérêt pour l’application JoyPop! En effet, l’application JoyPop peut aider les jeunes à mieux réguler leurs émotions. L’application JoyPop n’est pas encore disponible sur le marché, mais devrait sortir sur l’App Store pour appareils iPhone en 2019. Veuillez suivre @ joypop.app sur instagram ou JoyPop. App sur Facebook pour plus d’informations sur la sortie de l’application.